Today, we’ll put together a few things we’ve learned on the Learn To Fly Blog to introduce a skill every beginning student should develop: thinking in terms of a wind triangle. Check out last week’s posts on magnetic variation and using your E6B Flight Computer to determine magnetic heading, as well as early posts on navigation. Today’s post features excerpted content from the Pilot’s Handbook of Aeronautical Knowledge. Dead reckoning is navigation solely by means of computations based on time, airspeed, distance, and direction. The products derived from these variables, when adjusted by wind speed and velocity, are heading and GS. The predicted heading takes the aircraft along the intended path and the GS establishes the time to arrive at each checkpoint and the destination. Except for flights over water, dead reckoning is usually used with pilotage for cross-country flying. The heading and GS as calculated is constantly monitored and corrected by pilotage as observed from checkpoints. If there is no wind, the aircraft’s ground track is the same as the heading and the GS is the same as the true airspeed. This condition rarely exists. A wind triangle, the pilot’s version of vector analysis, is the basis of dead reckoning. The wind triangle is a graphic explanation of the effect of wind upon flight. GS, heading, and time for any flight can be determined by using the wind triangle. It can be applied to the simplest kind of cross-country flight as well as the most complicated instrument flight. The experienced pilot becomes so familiar with the fundamental principles that estimates can be made which are adequate for visual flight without actually drawing the diagrams. If flight is to be made on a course to the east, with a wind blowing from the northeast, the aircraft must be headed somewhat to the north of east to counteract drift. This can be represented by a diagram as shown in Figure 1. Each line represents direction and speed. The long blue and white hashed line shows the direction the aircraft is heading, and its length represents the distance the airspeed for 1 hour. The short blue arrow at the right shows the wind direction, and its length represents the wind velocity for 1 hour. The solid yellow line shows the direction of the track or the path of the aircraft as measured over the earth, and its length represents the distance traveled in 1 hour, or the GS. Figure 1. Principle of the wind triangle. In actual practice, the triangle illustrated in Figure 1 is not drawn; instead, construct a similar triangle as shown by the blue, yellow, and black lines in Figure 2, which is explained in the following example. Figure 2. The wind triangle as is drawn in navigation practice. Suppose a flight is to be flown from E to P. Draw a line on the aeronautical chart connecting these two points; measure its direction with a protractor, or plotter, in reference to a meridian. This is the true course, which in this example is assumed to be 090° (east). From the NWS, it is learned that the wind at the altitude of the intended flight is 40 knots from the northeast (045°). Since the NWS reports the wind speed in knots, if the true airspeed of the aircraft is 120 knots, there is no need to convert speeds from knots to mph or vice versa. Figure 3. Steps in drawing the wind triangle. Next, align the ruler with E and the dot at 45°, and draw the wind arrow from E, not toward 045°, but downwind in the direction the wind is blowing, making it 40 units long, to correspond with the wind velocity of 40 knots. Identify this line as the wind line by placing the letter “W” at the end to show the wind direction. Finally, measure 120 units on the ruler to represent the airspeed, making a dot on the ruler at this point. The units used may be of any convenient scale or value (such as ¼ inch = 10 knots), but once selected, the same scale must be used for each of the linear movements involved. Then place the ruler so that the end is on the arrowhead (W) and the 120-knot dot intercepts the true course line. Draw the line and label it “AS 120.” The point “P” placed at the intersection represents the position of the aircraft at the end of 1 hour. The diagram is now complete. Figure 4. Finding true heading by the wind correction angle. Figure 5. Finding true heading by direct measurement. heading. The compass heading can be used to fly to the destination by dead reckoning. TC—direction of the line connecting two desired points, drawn on the chart and measured clockwise in degrees from true north on the mid-meridian. WCA—determined from the wind triangle. (Added to TC if the wind is from the right; subtracted if wind is from the left). TH—direction measured in degrees clockwise from true north, in which the nose of the plane should point to make good the desired course. Variation—obtained from the isogonic line on the chart (added to TH if west; subtracted if east). MH—an intermediate step in the conversion (obtained by applying variation to true heading). Deviation—obtained from the deviation card on the aircraft (added to MH or subtracted from, as indicated). Compass heading—reading on the compass (found by applying deviation to MH) which is followed to make good the desired course. GS—obtained by measuring the length of the TC line on the wind triangle (using the scale employed for drawing the diagram). Estimated time en route (ETE)—total distance divided by GS. 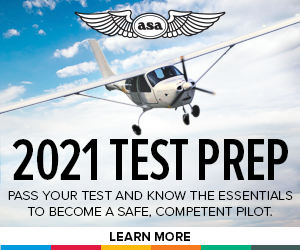 I took the knowledge test and used my ASA E6-B sliding flight computer for these problems. I wish I had tried figuring out how to calculate the wind triangle with trigonometry: Most electronic calculators have the trigonometry functions available on them, and you are allowed to use an electronic calculator during the test. The wind track angle (WTA) is the difference between the true course and the wind direction. Wind is given in the FROM direction, so the vector component is in the opposite direction. You need to add 180 degrees. *This is the same reason the drawing of the wing triangle is done by starting with the wind and drawing its vector away from the original starting point. The ground speed (GS) is found by combining the headwind component with the result of sacrificing airspeed for wind correction. 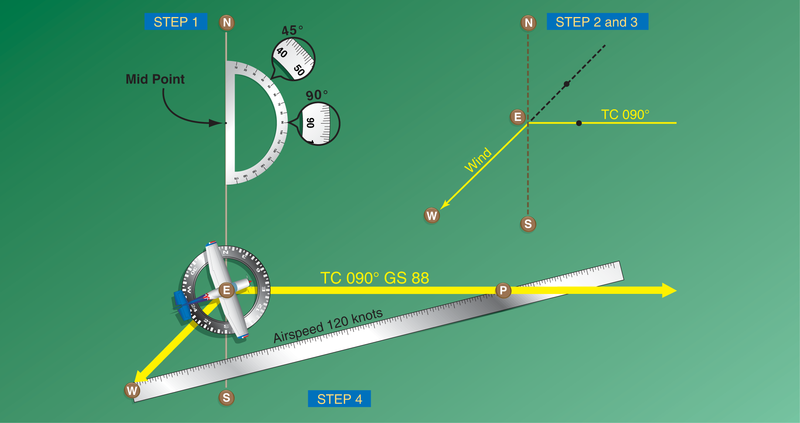 The resulting airspeed is the true airspeed (TAS) times the cosine of the wind correction angle (WCA). The headwind is the wind speed (WS) times the cosine of the wind track angle (WTA). Anyway, using trigonometry is a lot more complicated than the E6B to no surprise, It is nice to have a second option for calculating in case you want to check your work, as I did here. And everything did check out! Thank you for a more complete explanation. I was searching for a way to make the differenc legs of a aviation triangle to fit in my mind instead of just memorizing. I’ve been advised to memorize but my “why” is strong. If I know “why” I can remember “what”. One thing that could be clarified is the difference between “True Course” & True Heading”. I think the word True on the written test (& in my Gleim books) is the problem. I got a hint of the difference when you wrote, heading is direction airplane is pointed.